Download "GOOD SHEPHERD NON-PROFIT HOMES INC. HAMILTON POLICY MANUAL. Accessibility of Goods and Services to People with Disabilities"
2 goods and services and allowing them to benefit from the same services, in the same place and in a similar way as other clients. 1.3 Definitions Assistive Device An assistive device is a tool, technology or other mechanism that enables a person with a disability to do everyday tasks and activities such as moving, communicating or lifting. It helps the person to maintain their independence at home, at work and in the community. Barrier Any policy, practice or procedure, or part of the built environment, that prevents someone with a disability from participating fully in Good Shepherd programs or services because of his or her disability. Disability a) any degree of physical disability, infirmity, malformation or disfigurement, that is caused by bodily injury, birth defect or illness and, without limiting the generality of the foregoing, includes diabetes mellitus, epilepsy, a brain injury, any degree of paralysis, amputation, lack of physical co-ordination, blindness or visual impediment, deafness or hearing impediment, muteness or speech impediment or physical reliance on a guide dog or other animal or on a wheelchair or other remedial appliance device. b) a condition of mental impairment or a developmental disability c) a learning disability, or a dysfunction in one or more of the processes involved in understanding or using symbols or spoken language d) mental disorder, e) an injury or disability for which benefits were claimed or received under the insurance plan established under the Workplace Safety and Insurance Act, 1997 Reasonable Efforts The Customer Service Standard requires organizations to make reasonable efforts to meet the needs of people with disabilities. The library defines reasonable efforts as providing the best possible service within the context of: available resources, balancing the needs of people with disabilities with others who may encounter barriers to access and with the community at large, the health and safety of library staff and volunteers, the security of library property and existing laws and contracts. 3 Support Person A support person is an individual hired or chosen to accompany a person with a disability to provide services or assistance with communication, mobility, personal care, medical needs or access to goods or services. Service Animal Any animal used by a person with a disability for reasons relating to the disability where it is readily apparent that the animal is used by the person for reasons relating to his or her disability; or where the person provides a letter from a physician or nurse confirming that he or she requires the animal for reasons relating to his or her disability; or a valid identification card signed by the Attorney General of Canada or a certificate of training from a recognized guide dog or service animal training school. 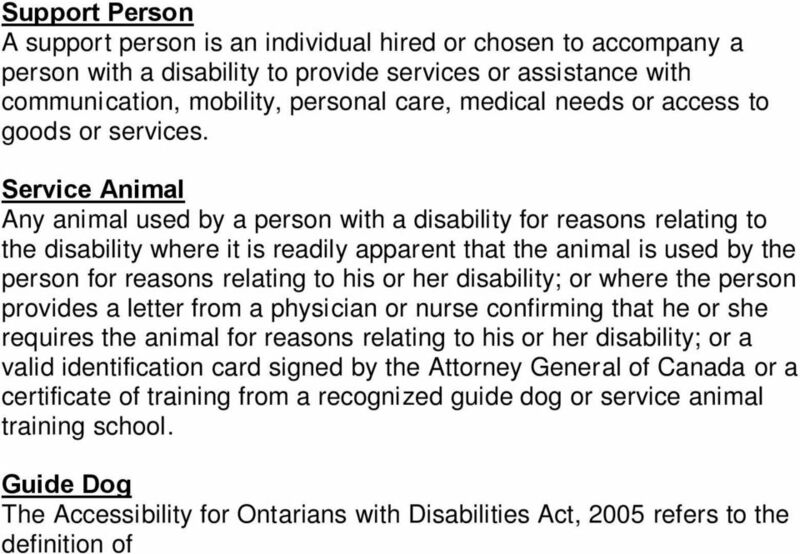 Guide Dog The Accessibility for Ontarians with Disabilities Act, 2005 refers to the definition of guide dog under the Blind Persons Rights Act, which states that: a guide dog is a dog that has been trained as a guide for a blind person at one of the facilities listed in Ontario Regulation 58 under the Blind Persons Rights Act. The Ministry of the Attorney General may issue identification cards to identify a person who is blind and his or her guide dog. 1.4 Providing goods and services to people with disabilities Good Shepherd is committed to excellence in serving all clients and visitors including people with disabilities and we will carry out our functions and responsibilities in the following areas: Communication We will communicate with people with disabilities in ways that take into account their disability. We will train staff who communicate with customers on how to interact and communicate with people with various types of disabilities Telephone services We are committed to providing fully accessible telephone service to our customers. We will train staff to communicate with customers over the telephone in clear and plain language and to speak clearly and slowly. We will offer to communicate with customers by , TTY, relay services or fax if telephone communication is not suitable to their communication needs or is not available. 5 about the reason for the disruption, its anticipated duration, and a description of alternative facilities or services, if available. The notice will be placed at all public entrances and service counters on our premises. 1.8 Training for staff Good Shepherd will provide training to all employees, (including, fulltime, part time, relief and contract staff), volunteers and others who deal with the public or other third parties on their behalf, and all those who are involved in the development and approvals of customer service policies, practices and procedures. Individuals in the following positions will be trained: This training will be provided to all new hires and new volunteers along with the orientation within the first month of hire, after staff commence their duties. 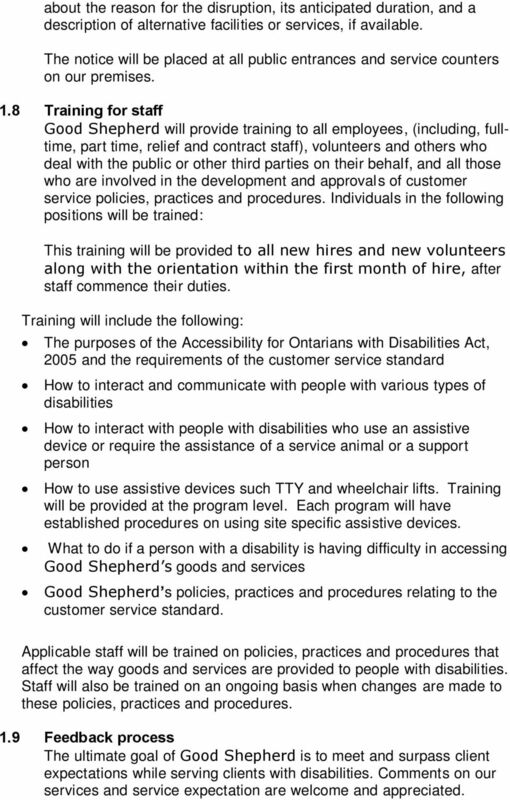 Training will include the following: The purposes of the Accessibility for Ontarians with Disabilities Act, 2005 and the requirements of the customer service standard How to interact and communicate with people with various types of disabilities How to interact with people with disabilities who use an assistive device or require the assistance of a service animal or a support person How to use assistive devices such TTY and wheelchair lifts. Training will be provided at the program level. 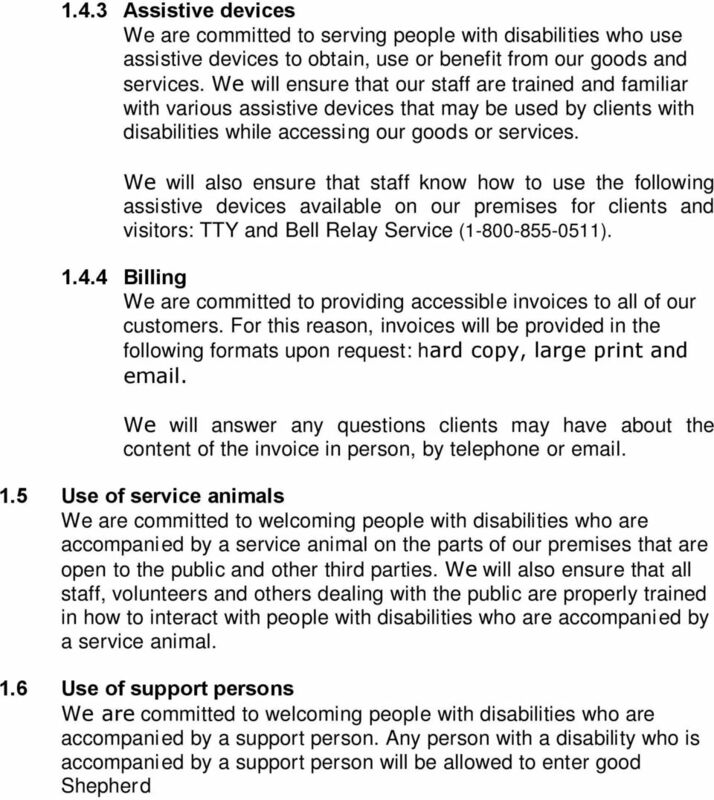 Each program will have established procedures on using site specific assistive devices. 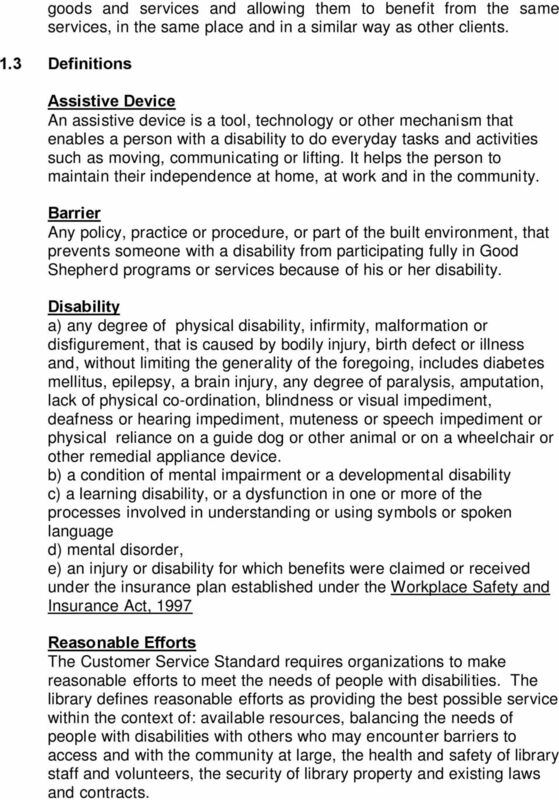 What to do if a person with a disability is having difficulty in accessing Good Shepherd s goods and services Good Shepherd s policies, practices and procedures relating to the customer service standard. Applicable staff will be trained on policies, practices and procedures that affect the way goods and services are provided to people with disabilities. Staff will also be trained on an ongoing basis when changes are made to these policies, practices and procedures. 1.9 Feedback process The ultimate goal of Good Shepherd is to meet and surpass client expectations while serving clients with disabilities. Comments on our services and service expectation are welcome and appreciated. Mental Health Acute Inpatient Service Users Survey Questionnaire What is the survey about? This survey is about your recent stay in hospital for your mental health. Who should complete the questionnaire?